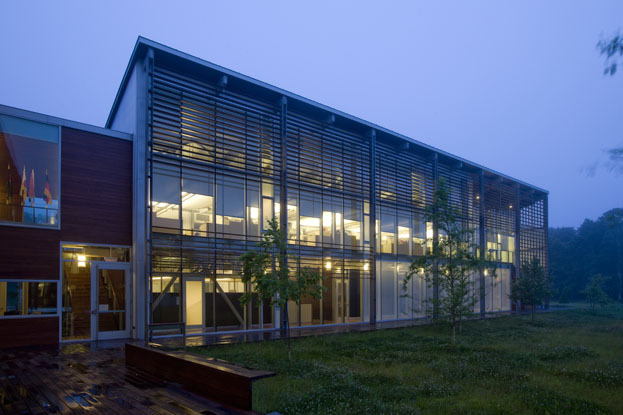 When the International Fund for Animal Welfare (IFAW) based on Cape Cod, Massachusetts, outgrew its headquarters of nearly 30 years, the organization knew it wanted a building that minimized human impact on the environment. In thinking about its future home, IFAW wanted the building to embody its mission to protect animals and their habitats. At the same time, the organization also aimed to incorporate water conservation, energy efficiency, and recycled/renewable materials. 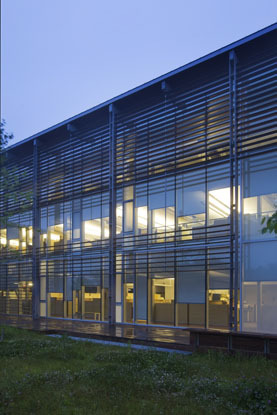 The new Gold-LEED-certified IFAW headquarters, by Boston based designLAB architects, achieved all that and more. 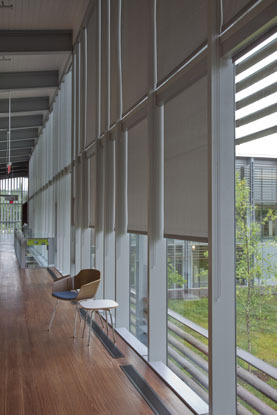 The structure features an energy-efficient shading system for natural daylighting with Hunter Douglas roller shades, incorporates significant recycled and sustainable building materials and smart architectural design to reduce its overall footprint. Even the site is sustainable: the building is sited on a former brownfield that was covered with contaminated soil and littered with tires, metal scraps and other debris. At one point it had become "a town dump," says Sam Batchelor, project manager for designLAB. Comprised of three two-story, barn-like structures totaling 40,000 square feet, IFAW's headquarters delivers from an environmental standpoint with its low-cost, pragmatic approach. The building also pays homage to the vernacular architecture and reflects the international identity of the worldwide organization with a "distinctly modern design," according to Batchelor. A local 18th century farm in nearby Barnstable inspired the landscaping, says Batchelor, incorporating a traditional Cape Cod meadow, low-sloped hill, native grasses, and a wooded edge. The three structures echo the "iconic Cape Cod image" of a Herreshoff sailboat, as if "three sailboats are tipped on their sides." The white boards of the hull are reflected in the North, West, and East sides of the building; and the structures' views facing the open meadow and courtyard - the focal point of the site - evoke the openness of a sail. Wrapped around the courtyard is a south facing, full-height glass curtain wall, lined with a sun louver system made of striking dark, rich jarrah wood, a quickly renewable wood from Australia. Adjacent to the curtain wall on the ground floor is an exterior boardwalk and a contiguous indoor flooring walkway. Where the curtain wall meets the courtyard, there's a "blurring between inside and outside," says Batchelor. "You feel like you are stepping outside even though you are still in the building. And other times you feel like you're within the building even though you're actually outside." 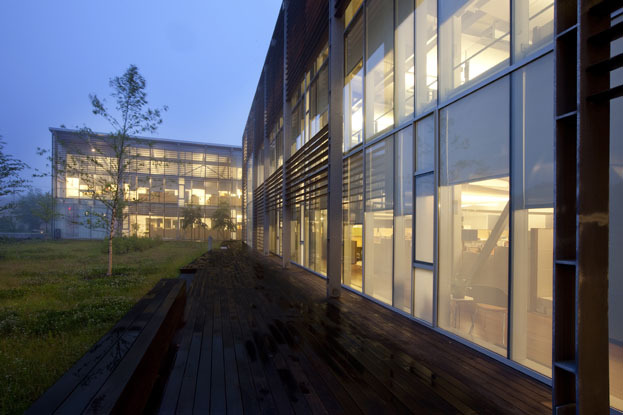 The headquarters' flexible floor plan, abundant natural light, and images and information about the organization's activities blur the boundary with the outdoors throughout the building. For example, seven collaboration rooms feature graphics from the IFAW's wildlife efforts. One is seal themed, another elephant themed. Visitors to a resource room can view a dynamic and evolving display of recent victories projected on a world map. The building houses 125 employees, but uses only half the square footage per person by expanding collaborative workspaces that facilitate communication and openness among employees of the 12 departments. According to Kerry Branon, IFAW's Media Assistant Manager, "the open building design enhances IFAW's efficiency and effectiveness. It's a great office environment. Staff bring their dogs to work regularly and it's a great benefit." 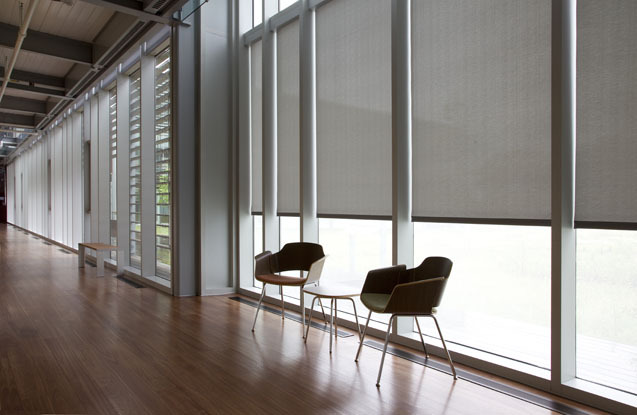 Key to the building's connection to the landscape is the curtain wall system - with its exterior fixed wooden sun louver system and interior roller shades by Hunter Douglas, made with 1 percent duotone GlacierScreen™ fabric. 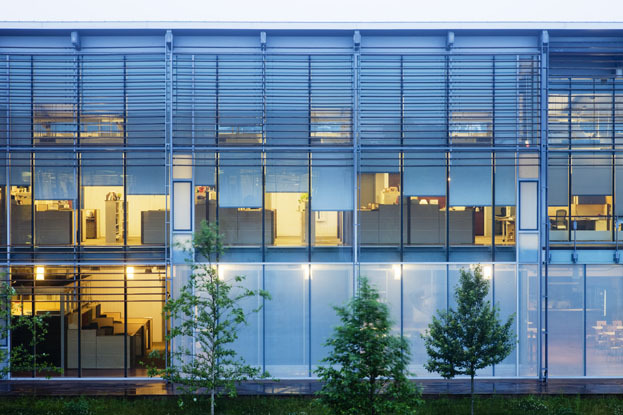 The louvers, fritted glass, and roller shades work together to protect against solar heat gain in summer, allow sunlight to warm the building in winter, and reduce the need for artificial lighting and gas heating. "People are happy to come to work," adds Batchelor. "They have great views of the outdoors. They have plenty of daylight." The roller shades are installed in the windows throughout the interior perimeter of the building, in all three wings. 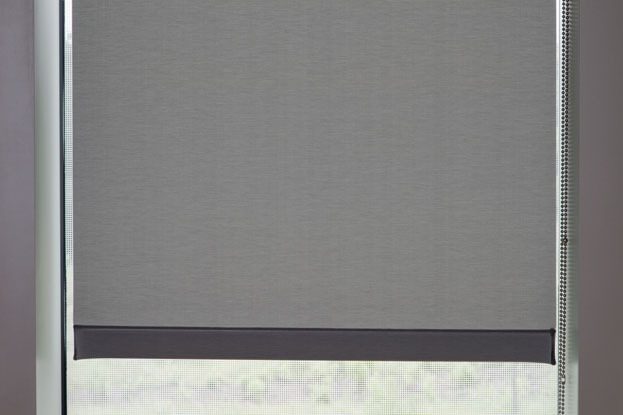 "These shades are most useful in the winter months when the sun is lower on the horizon and can be in people's work zone," says Hunter Douglas Contract sales manager Patrick LeClair, AIA. 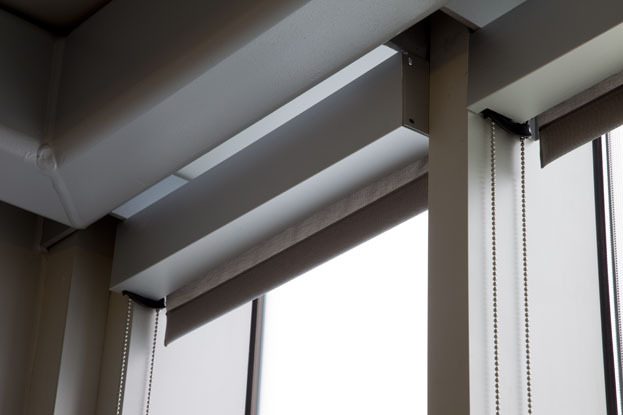 When the roller shades are down, says Batchelor, the sun "warms the air pocket around the edge of the building" between the glass and the shade - providing thermal heat in winter. At the same time, people can see through the white-and-black weave duotone GlacierScreen™ fabric. "The beauty of the roller shades is that they cut down on the glare, but give excellent sight lines," says LeClair. "They truly compliment the design intent." 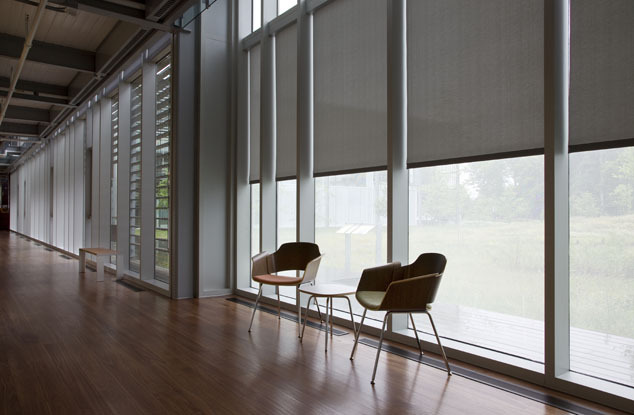 The versatile GlacierScreen™ fabric accommodates long, narrow curtain wall sections without bowing or billowing, adds LeClair. Made with PVC-covered high-tensile polyester fabric that is VOC-free, antimicrobial, and GREENGUARD® certified." 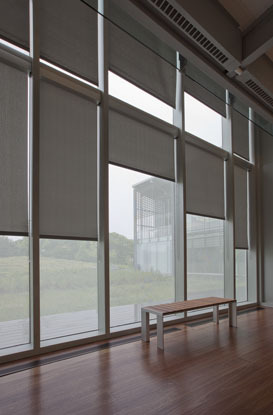 The roller shades, installed by Contrak Draperies of North Providence, include fascias fully recessed within the curtain wall system. In addition to energy efficiency gained through the sun louvers and roller shades,the design team incorporated a wide range of other environmentally conscious technology and materials: a natural water filtration system that uses bioswales and rain gardens to channel runoff from the parking lot into a vegetated area; an evaporative-cooled air conditioning system with ozone-friendly refrigerant; a high-efficiency gas heating condensing boilers; and fluorescent lights. Branon states the new headquarters was "designed to consume 32% less energy than a typical office building." 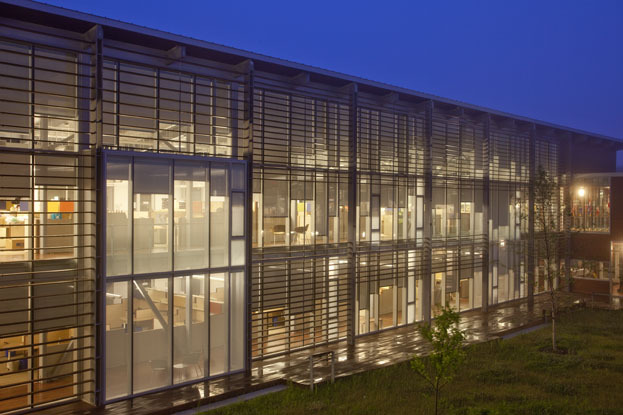 Further, the IFAW headquarters uses wood harvested from sustainably managed forests and recycled construction materials. 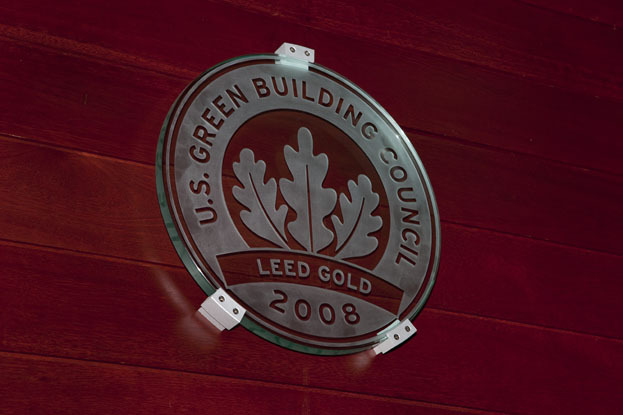 IFAW's headquarters achieved a Gold rating in the Leadership in Energy and Environmental Design (LEED) Green Building Rating System and was selected by the American Institute of Architects as one of the top 10 examples of sustainable architecture and green design for 2009. "The green design reflects our commitment to protect animals, their habitats and the environment." From the wildlife images on the walls to a curtain wall system that helps blur inside and out, the division between nature and people has dissolved in IFAW's new home. Says Batchelor, "You feel connected to the people around you in the building, but at the same time connected to the landscape and the environment."